Reggie Jackson got the SI treatment last week, and as so often happens with these things, 3800 words worth of profile have been discarded and distilled into two measly quotes, ever-so-slightly controversial. And now, allergic to anything resembling a deviation from a murderously boring and marketable company line, the Yankees have given Reggie a big time out. He believes that the Baseball Writers Association of America, whose members vote for the Hall, have adopted too low a standard. "I didn't see Kirby Puckett as a Hall of Famer," he says. "I didn't see Gary Carter as a Hall of Famer. I didn't see Don Sutton as a Hall of Famer. I didn't see Phil Niekro as a Hall of Famer. As much as I like Jim Rice, I'm not so sure he's a Hall of Famer." What about Bert Blyleven? "No. No, no, no, no," Jackson says. "Blyleven wasn't even the dominant pitcher of his era — it was Jack Morris." He isn't silent on the subject of steroids in baseball either. Jackson makes no secret of his displeasure that since his retirement in 1987, he has been passed on the home run list by seven players, five of whom, Rodriguez, Barry Bonds, Mark McGwire, Rafael Palmeiro and Sammy Sosa, have been linked to performance-enhancing drugs. "I don't think the fans really count them, and I agree," he says. "I believe that Hank Aaron is the home run king, not Barry Bonds, as great a player as Bonds was." Jackson was a supporter of Bonds (who is a distant cousin) as recently as 2007, when he said, "They tried to get this guy more than anybody ... and they've got nothing on him." But he says now that the volume of evidence against Bonds is so great that he has changed his mind. And A-Rod? "Al's a very good friend," Jackson says. "But I think there are real questions about his numbers. As much as I like him, what he admitted about his usage does cloud some of his records." Reggie Jackson is a "special advisor" to the Yankees, which is essentially a mascot without a costume. He's trotted out for PR, and to reward him for being such a good company man over the years, so the Yankees can afford to censure him for the slightest of missteps. But, my god, this registers somewhere below "photographed not picking up after dog" on a list of action-worthy transgressions. This isn't Jimmy the Greek endorsing slavery eugenics or Marge Schott endorsing Hitler for chancellor. Reggie's two points—that steroid use should be taken into account by HOF voters, and that too many borderline Hall of Famers have been inducted—are not crazy talk. The vast majority of Americans believe the former, and a quorum of sportswriters have spent decades debating the latter. So when Reggie Jackson (who himself is in the Hall more for his fame than his play) offers his personal opinion on these two topics, it seems a little excessive for the Yankees to tell him not to come to work for a while. 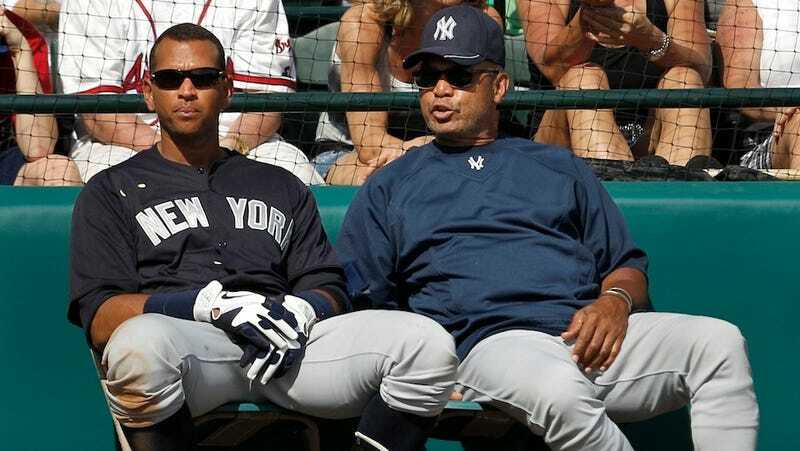 Though Buster Olney says the Yankees are just as mad about the non-Rodriguez-directed comments, you have to think they're a little sensitive given that they're on the hook for $143 million dollars for a player whose power numbers have already started the natural aging decline. It explains, but doesn't excuse the Yankees from being overzealous fascist babies about the most innocuous of comments, comments that we're only still talking about because they're trying to retroactively silence the messenger.